This updates your NBA 2K15 PC roster as of July 31, 2015. It includes the most recent trades and transactions, and adds rookies, D-League players, missing players, etc. See the full details below. 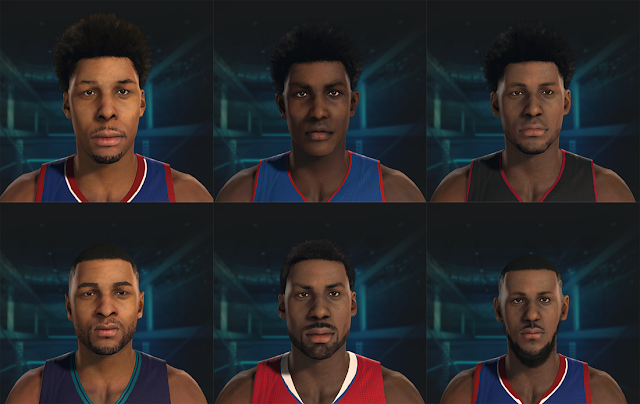 2015 NBA Rookies (right to left): Jahlil Okafor (PHI), Stanley Johnson (DET), Justise Winslow (MIA), Aaron Harrison (CHA), Branden Dawson (LAC) and Pierre Jackson (PHI). Created players resemble real life players(for the most part –– CAP's with skin complexion #6 are the least accurate and certain hairstyle compromises had to be made). Players not only resemble themselves, but also play like themselves. Players signature stylings were captured, and tendencies were made to simulate thier style of play. Footage, scouting reports and watching the players in actual games were all used to adjust tendencies. Rookie ratings were also based on the aforementioned data and were constructed to align with the 2K rookie ratings scale. *Some created players in the game are still 2K players...I only remade a select few of them. For example, Jakarr Sampson is 2K made, wile Elijah Millsap is a guy I remade. You will be able to tell the difference(for the most part). Tendencies were adjusted in detail for each team to simulate accurate touches and shot attempts for players. In other words, stars play like stars, teams play like themselves and the ball distribution of teams is more accurately portrayed. Adjustments were also made to post game tendencies with attention to making the post game more realistic. Players like Dwight Howard will be more likely to back you down in the post than shoot fadeaways or shimmy shots. It is possible to be dominated in the low post in this roster. Signature shots, dunks, and more were accurately adjusted for nearly every player in the league. Ratings were tweaked/updated league wide to reflect the recent season performance, and for shooting, speed(very similar to speed update made by 2K with some adjustments), defense and more. Overall ratings line up nicely in this roster, though adjustments were not made solely in consideration of overall rating. The ratings were adjusted in consideration of how players with comparable attributes were rated in particular areas, and statistical data. Signature badges were also adjusted in some cases. Virtually every transaction to date has been reflected in this roster. I might have missed a few players, so If you find any players/camp invites missing, feel free to let me know. I plan to make updates every now and then either way. Because this roster is based off a roster update prior to Patch #4, it is best experienced with my sliders, which are below. The sliders were created to capture the flow of an NBA game. I have experienced realistic shot attempts, PIP, free throw attempts, 3pt attempts, and a generally more realistic and human–like CPU opponent with these sliders. The sliders are meant to be played on Hall of Fame difficulty... patch #4 seems to have neutered the Superstar difficulty completely. These sliders are sim sliders, so against certain teams, it may require change in strategy and actual good basketball to win. The sliders were adapted to increase computer turnovers and mistakes, but you still need to force turnovers with good defense. Shooting with these sliders is such that you will need to contest shots if you expect the CPU to not score, but the CPU will not hit every single open shot either. I have not tested these sliders in a User vs. User game, but they should work just as well. Number sign denotes a random Steam user id. Not tested on non-steam versions. You can also download this NBA 2K15 PC roster via 2K Share. From the game's main menu, select 'Options / Features' and choose 'Create Roster'. Select 'Search by online id' (Press 'Y' or △) and type in 'eo718' without the apostrophes. Look for 'The Sigmaster - Offseason' and save it.